OK, so yesterday we talked about loot. About $100,000 in loot, conveniently packed into a box no more than six inches wide, and maybe three inches deep and two high. More or less. What about real treasure. The kind you imagine you find in a dark hole that took you months of delving? Well, let’s consider the value, and then, how to move that value. 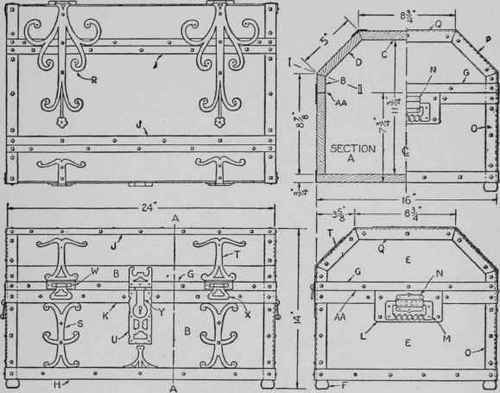 The pirates treasure chest diagrammed is a home-built design, for fun (not mine), and the base measures about 16x24x9″. Let’s go with that figure, and look at the gold bars in the first image. They’re about eight wide, two deep. So figure about 8″ long, perhaps 3″ wide, and let’s go with about 2″ deep. Or for Canadians like +Tim Shorts, about 20×7.5×5 cm. In short, that chest can notionally hold 2x8x4 = 64 gold bricks. Each brick is 825 cubic centimeters – and again I use this number because I know the density of gold easily in g/cc, which is 19.3. So each brick weighs 35 lbs. And there are 64 of them. At about $70,000 a pop. The hard part won’t be killing the monster. It’ll be the physical therapy from literally a metric ton of gold: 2,250 lbs in that one chest. Hell, I wonder if you could even lift it? Without ruining the chest, I mean. The good news, is that our established price of $44,000 per kg makes 1,000 kg easy to calculate – $44,000,000 in one not-terribly transportable box. What about other metals? Well, an equivalent brick of copper would weigh 16.2 lbs, and sliver, at 19 lbs. So silver would be $19,000 per brick, and copper? A measly $1,000 each, but it’s only a half-ton, with silver being only slightly more, tipping the scale at 1,200 lbs. That chest full of silver ain’t bad, a cool $1.2M, and literally about 1,000 lbs of copper would be required to purchase Cadmus’ enchanted armor suit. Of course, if you really want to go big on your treasure, consider the world’s largest solid gold statue. 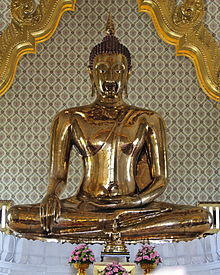 A golden buddha about ten feet tall. The statue isn’t all pure gold, but the higher up you go on the body, the more pure it is, likely for structural as well as spiritual reasons. It is 5,500 kg, and if we assume the bulk of it is about 60% pure, we’re dealing with 3,300 kg of gold, plus other metals. $145 million. If it were pure, it would be $240 million. How hard can it be to move a few tons of metal, or stone? I mean, the Assyrians could do it . . . Previous Previous post: How cute! Little bitty treasure! I always laugh when people easily lift bars of gold bullion one handed in movies. And by "laugh" I mean "scrunch my face disproovingly."